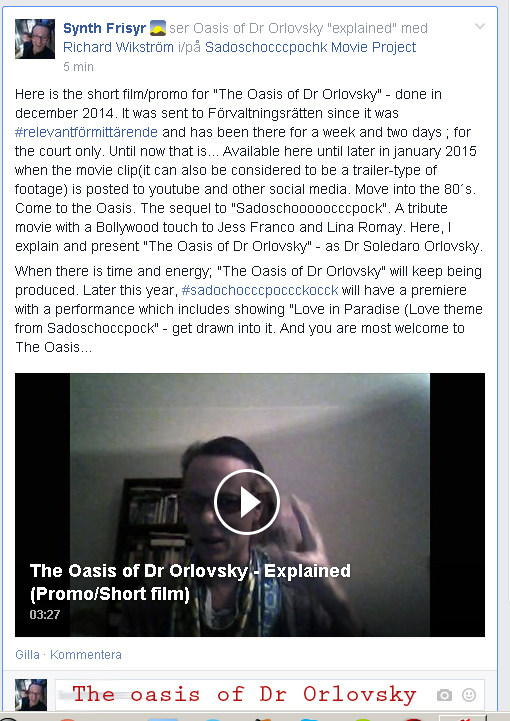 Here is the short film/promo for ”The Oasis of Dr Orlovsky” – done in december 2014. It was sent to Förvaltningsrätten since it was #‎relevantförmittärende and has been there since christmas day 2014. After that, the clips was posted for viewing in D3K. Until now that is… The movie clip(it can also be considered to be a trailer-type of footage) is posted to youtube and other social media. Move into the 80´s. Come to the Oasis. The sequel to ”Sadoschooooocccpock”. A tribute movie with a Bollywood touch to Jess Franco and Lina Romay. Here, I explain and present ”The Oasis of Dr Orlovsky” – as Dr Soledaro Orlovsky. When there is time and energy; ”The Oasis of Dr Orlovsky” will keep being produced. Later this year, #‎sadochocccpoccckocck will have a premiere with a performance which includes showing ”Love in Paradise (Love theme from Sadoschoccpock”) – get drawn into it. And you are most welcome to The Oasis… Yes, the movie is ”explained” but it will be needed to see the actual feature film to fully grasp the concept of the Oasis. Also, it is recommended to first see ”Sadochocccpocck”. Yes, come to the Oasis of Dr Orlovsky – and first; get drawn into Sadoschooooocpock. The Tentacles of Dr Orlovsky – Second official trailer is now online. Move into the 90´s and get embraced by the tentacles. This is also the second trailer done for this planned movie in 2014 (more trailers will be produced). It was sent to Förvaltningsrätten since it was #‎relevantförmittärende and has been there. Now, it is available on social media and it is possible; as with #sadoschoooccpock to get drawn into it. Get drawn into the Tentacles. The name may change to another title; but it is a planned tribute movie to Jess Franco and Lina Romay. The tentacles are real, they are closing in and you can get embraced – by ”The tentacles of Dr Orlovsky”. First, #‎sadoschoccocccpock which is finished. Then, ”The oasis of Dr Orlovsky” which is being produced. And later, as a planned film: The Tentacles of Dr Orlovsky. A Bollywood touch, and a planned #ffa & #pfk project. Beware the tentacles. Beware Fhu manzui. Get embraced by it. The Oasis of Dr Orlovsky – The third trailer. Here is the third official trailer for ”The Oasis of Dr Orlovsky” – also one of the last trailers done for this movie in 2014. It was sent to Förvaltningsrätten since it was #‎relevantförmittärende and has been there for a few days; for the court only. Until now that is… Move into the 80´s. Come to the Oasis. The sequel to ”Sadoschooooocccpock”. A tribute movie with a Bollywood touch to Jess Franco and Lina Romay. Here is the last trailer for Sadoschocccooocccpock made during 2014. It was delivered to Förvaltningsrätten as part of my case and has been for their viewing for around two weeks.. Also, for The Disciples of 3K a few days since January 1, 2015. As mentioned before, Sadoschoccccck is a tribute movie to Jess Franco and Lina Romay with a Bollywood 1970´s filter. Of Dr Orlovsky. Explained, as a screenshot above.